BJP chief Amit Shah accused the Congress of doing "injustice" to Gujarat. Amit Shah launched the 'Gujarat Gaurav Yatra' (March for Gujarat's Honour). 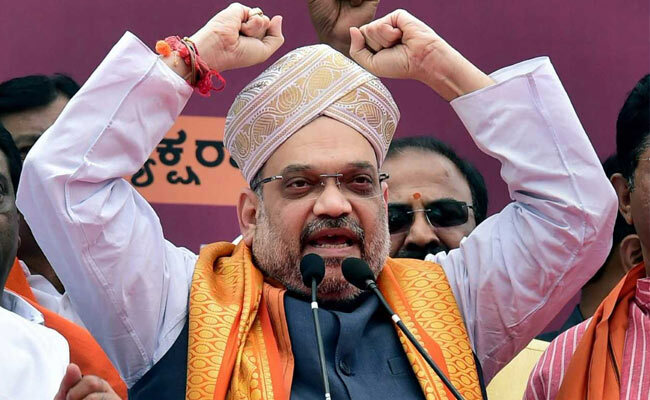 Karamsad, Gujarat: BJP chief Amit Shah today accused three generations of the Congress party of having "insulted" Gujarat, as he virtually sounded the bugle for the Assembly polls in the state from Sardar Vallabhbhai Patel's native place. In a gesture loaded with symbolism, Mr Shah paid tributes to Sardar Vallabhbhai Patel at his ancestral home in Karamsad with Chief Minister Vijay Rupani and his deputy Nitin Patel in tow, before invoking icons of Gujarat, including Patel, Morarji Desai and Narendra Modi, to mount an offensive against the Congress. He also launched the 'Gujarat Gaurav Yatra' (March for Gujarat's Honour). "Rahul Gandhi comes here and seeks answer from us as to what has the BJP done for the state. We are seeking an answer from you (the Congress) for injustices that the three generations of your rule did to us," the BJP president said. "While the first generation of Congress insulted Sardar Patel by not giving him his due recognition and Bharat Ratna, Congress Prime Minister Indira Gandhi did injustice to Morarji Desai," Mr Shah alleged. "The third generation of (Congress leaders) Sonia Gandhi and Rahul Gandhi have done injustice to Narendra Modi, and Gujarat seeks answer for that," he said. Morarji Desai was a deputy prime minister under Indira Gandhi before falling out with her. He became the prime minister in 1977 when the first non-Congress government was formed after Emergency. Mr Shah, while referring to PM Modi was apparently hinting at the attacks he faced, particularly from the Congress, following the post-Godhra communal conflagration. PM Modi, as the Gujarat chief minister, had taken out a yatra by the same name before the 2002 Assembly elections. Mr Shah's roadshow, being conducted in the run up to the Assembly polls likely in December, will cover central Gujarat on its first leg. Around four-five people in the crowd tried to raise slogans in support of the demand for reservation for the politically influential Patel community in government jobs and educational institutions but were whisked away by police. Addressing the gathering, Mr Shah accused the Congress of doing "injustice" to Gujarat, generation after generation, and said that in the upcoming Assembly election, the people of the state will make fun of those who "mock Gujarat's development model". "The BJP today launches Gujarat Gaurav Yatra from the same land of Sardar Patel from where he raised the voice of the farmers and started the work to unify the country," he said. Mr Shah also enumerated various achievements of the BJP-led governments in the state. He compared the situation in Gujarat in 1995, when the BJP wrested power from the Congress, to what the state achieved till 2017 in power generation, farm production, education, police modernisation and road construction. "When Narendra Modi was the chief minister, he created a Gujarat development model which has today become a model for the entire country. This model is Gujarat's pride," he said. He said PM Modi ensured 24X7 electricity, water through Narmada dam and investments through Vibrant Gujarat Summit. The "Sonia-Manmohan Singh" government, during the UPA's 10-year rule, did "great" injustice to Gujarat by holding up the Narmada dam project, he alleged. After PM Modi became the prime minister, he gave approval for raising the height of the dam, the BJP president said. "The gates (of the Narmada dam) are closed and water has started reaching Rajasthan," he said. Mr Shah said Gujarat got an All India Institute of Medical Sciences (AIIMS), a bullet train, and several other projects after Narendra Modi became the prime minister. The second leg of the Gujarat Gaurav Yatra will be launched by Mr Shah tomorrow from Porbandar, the birth place of Mahatma Gandhi. The yatra will continue till October 15. It will be held on two routes simultaneously. Prime Minister Modi and Mr Shah will remain present at the concluding ceremony of the yatra, the place for which is yet to be decided.